-With the fan shroud, fan clutch, and intake out of the way you can remove the A/C belt. -Pop off the tensioner pulley cover (to the right of the harmonic balancer) with a standard screw driver. Use a 5/8 / 16mm socket or T47 and breaker bar to put tension on the bolt inside the pulley, rotate clockwise; pull off the belt. -Put the Drain pan under the car. -Remove the 22mm drain bolt at the front bottom of the rack and pinion and drain the fluid. -Remove the two 10mm bolts holding on the power steering cooler. -Remove the four 13mm bolts holding on the power steering pulley. -Hit the Pulley with a rubber mallet to get it off. -Remove the two 13mm long bolts holding on the Pump mount. -Remove the two 10mm nuts mounting the fluid resevoir. -Take off the cap and pour out the fluid into the pan. -Cut the factory clips on the reservoir hoses to remove them. -Drain the fluid into the pan from the hoses. -Remove the 19mm Banjo bolt going to the return line on the Rack and Pinion. -Remove the Pump, reservoir, and return line. -Remove the 22mm banjo bolt going to the power steering cooler line on the rack. -Dont lose your Banjo Bolt crush washers! -Pull the Power steering cooler through the front of the car. -Bolt on the Block off plate on the rack and pinion where the lines went, re-use your banjo bolts and the new crush washers. 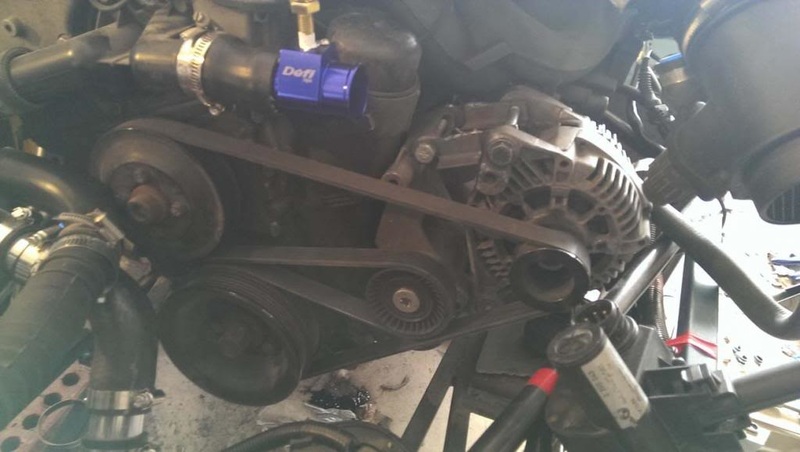 Usually would be the part where you put on the belt and are finished, but you will notice your belts rub where the alternator side and tensioner meet. 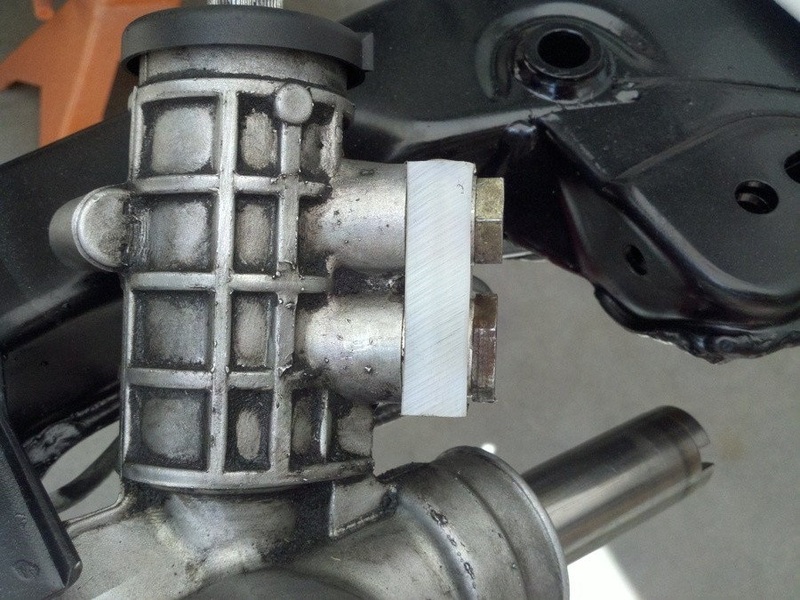 Make a 3 inch/ 75mm long angle bar extension to push out the alternator like in the picture. or do what I did and cut off the plastic wheel portion of the tensioner pulley leaving onthe the smaller metal bearing housing. I'm sure a timing bearing would work better, but this seemed to do the trick.